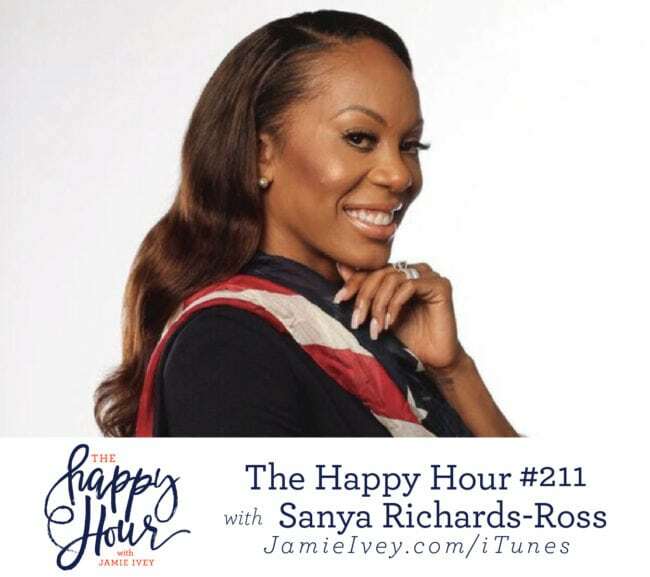 My guest for The Happy Hour #211 is Sanya Richards-Ross. Sanya is a 4-Time Olympic Gold medalist in track and field, NBC Sports Analyst, Nike brand ambassador, entrepreneur, speaker, and author. Sanya still holds the fastest American record in the 400! If you’ve listened to the show for a while, you guys know my love of sports. But, you may not know that I was in the Olympics for track and field… ok, ok, so it was the Junior Olympics in 9th grade, but still! You can imagine my excitement to have Sanya on the show today – I was so giddy I even showed her my Junior Olympics medals! Sanya tells us about what it was like to be a professional athlete and compete in 3 Olympic Games. Sanya also tells us how she made the decision to retire at the Olympic Trials before Rio due to injuries. Sanya speaks of God’s faithfulness in how she was still able to be a part of the Rio games as a sports analyst, and became the first woman in the commentator booth in 20 years. Sanya and I then talk about her walk with Jesus including the day she crossed a line she never thought she would and had an abortion. Sanya shares how she felt unredeemable and completely broken. She then describes a bus ride where she ended up lost and alone in China at the Beijing Games, and Jesus met her exactly where she was and helped her know He still loved her and that He forgave her. I enjoyed talking with Sanya today so much, and I hope that through our conversation you see how God loves His children, and through the giftings He gives as well as in our brokenness, He is always faithful and always good. Stay connected and subscribe to The Happy Hour Newsletter! The Happy Hour Summer Book Club’s September Book: If You Only Knew by Jamie Ivey – join in the fun and conversation! Enter the The Happy Hour Book Club Contest – use #happyhourbookclub to show us how you’re enjoying The Happy Hour Book Club and you’ll be entered to win! Do you love The Happy Hour? If so, we’d love if you’d leave a review! Prep Dish – $4 for one month! Molekule – use code: Jamie for $75 off! Noonday Collection – Become an Ambassador and get a pair of Jamie’s favorite earrings!